Chatbots are set to make their mark on the business landscape in 2018. Although many forward-thinking companies have already adopted this innovative Artificial Intelligence (AI), popular predictions dictate that we’ll be seeing more and more businesses taking advantage of the connectivity and streamlining opportunities that chatbot technology can offer.Figures like Mark Zuckerberg have already praised the value that chatbots can offer to businesses, but it’s not just Fortune 500 companies that are adding the automated messenger interface into their customer service offerings. Small to medium sized companies now have easier access to artificial intelligence and are seeing why 2018 is all about the introduction of chatbots for business. By now, it’s rare to hear a business owner ask the question: “what is a chatbot?” However, we’ll give a little background into the chatbot technology for those that are new to the phenomenon. A chatbot is basically an online service that uses artificial intelligence to interact with users, through a chat or messenger interface. Businesses opt for chatbots for both their fun and functionality and it can live within any major chat technology. A chatbot is a robot that’s always available and can be programmed to follow “rules” or answer particular questions, so it can have a cohesive and fluent conversation with web users. Since around 90% [source] of a consumer’s online time is spent within email and messenger platforms, it makes perfect sense for companies to ensure they’re available where their customers prefer to hang out. Don’t wait for web technologies like this to pass you by. Instead, make your business one of the early adopters of chatbots and you’ll see the benefits for both your company and your customers. Whether you run an e-commerce platform or offer a local service, get these clever little bots working for you. Customers can access information instantly. Chatbots are available 24/7, even when the rest of us are asleep. 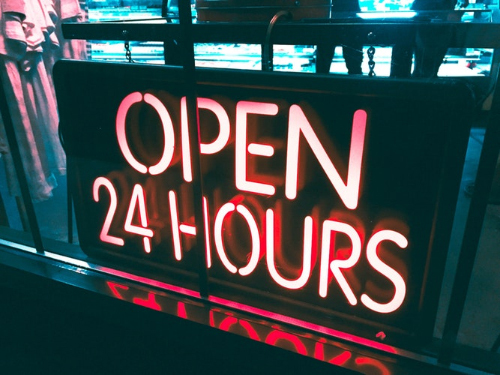 Your customers might want to engage with you at different times of the day, so make sure someone or something is in place to respond straight away. For example, if you have an e-commerce site selling beauty products, your bot could ask customers what they’re looking for and then show them how to find it. The process is a little more personal than traditional online shopping and mirrors a real retail experience instead. People use messenger apps more than social networks. Surprising, but true! There are around 3000 million active monthly users on the big 4 messaging apps, compared to 2500 million using the big 5 social networking apps. [source: chatbotsmagazine] Your customers would prefer to chat to you than scroll through company updates and photos of the CEO’s dog (as cute as it may be!). Chatbots offer a huge business opportunity for those willing to jump on the bandwagon early on. Give customers an alternative contact method. Most people hate picking up the phone these days, and they shouldn’t have to. When the public expects to be able to communicate through an online messenger service, make sure you can accommodate that. Chatbots are cheaper and more efficient than human representatives. Chatbots have the ability to respond to enquires almost immediately, so customers can get the answers they need without delay. They’re cheap to run, too, so incorporating artificial intelligence into your customer service could save you money in the long run. Chatbots are able to employ rich content. Chatbots aren’t limited to text, but they can also display rich content such as images and videos. This could prove useful for businesses that want to showcase products or the benefits of their services. Access larger audiences. Facebook Messenger has almost 1 billion users every month. [source: mybusiness]. Chatbots offer a quick way to communicate with larger volumes of people and can service more than one customer enquiry at a time. What can we expect to see from chatbots in the near future? Chatbots are a relatively new technology but with advancements in the industry, we’re likely to see some dynamic changes very soon. Here are our predictions for the future of artificial intelligence in business. When surveyed, 80% of brands said they planned to install chatbots within the next four years, as a streamlined way to improve customer service [source: businessnewsdaily]. With technology advancing at such rapid speeds, your company could fall behind your competitors if you don’t adopt innovative technologies to continuously improve your services. Currently, only 36% of those interviewed are already using chatbots, suggesting that brands aspire to install the technology but may worry that implementation is a complicated procedure. It’s likely that large brands will adopt the technology first and it will then trickle down to more smaller businesses. While the millennial demographic is the most likely to accept the use of chatbots for business, some other consumers have expressed their preference for interaction with human representatives. This desire doesn’t arise from a need for human interaction, but rather the belief that humans can answer questions more accurately than chatbots can. For this reason, the type of chatbots we see is likely to evolve. Tech companies will develop bots that can easily interpret and respond to natural speech and be able to answer more complex questions. In essence, the experience with a messenger interface will become more akin to an experience with a human. Small to medium-sized businesses will not be left behind when it comes to web technologies like chatbots. While the technology was initially developed for larger tech companies, it’s becoming cheaper, technology is improving and demand is growing. That means that in the next few years, we’ll be seeing more smaller companies pushing out chatbots and more customers expecting the service. Guess what? You don’t have to be an expert in computer science to take advantage of chatbots for business. Artificial intelligence is something that is becoming more widely available and there are professional companies out there that can take care of the whole thing for you. You can choose between rule-based chatbot technology and machine-learning bots with an artificial brain. 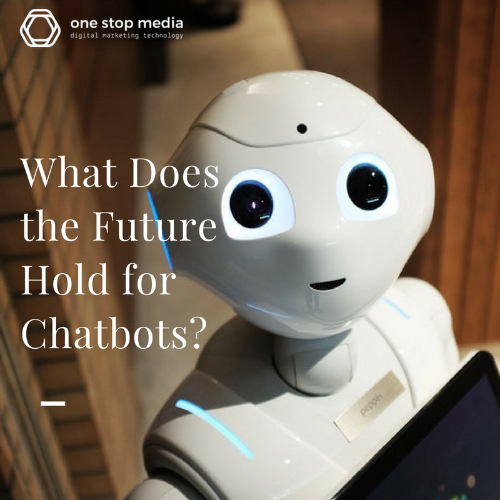 There are benefits to both and the choice often depends on the type of business you’re running, so speak to One Stop Media about their options for chatbot technology. As leaders in the field of technology, One Stop Media latched onto this AI trend when it was a brand new phenomenon. Our experts can quickly and simply embed a chatbot service onto your website to give you that coveted digital edge over your competitors. Give us a call on 1300 305 619 and our developers in Melbourne can show you how easy they can make it.